A couple of weeks ago a popup has appeared whenever I startup telling me that an application wants to access the keyring but it doesn't say which one. I'm used to seeing the application name on the popup but here it just says 'application'. I haven't changed any passwords or did anything that might have something to do with that, to my knowledge. I saw this question but like I said, I haven't changed any of my passwords, and I don't want my keyring password to be empty. 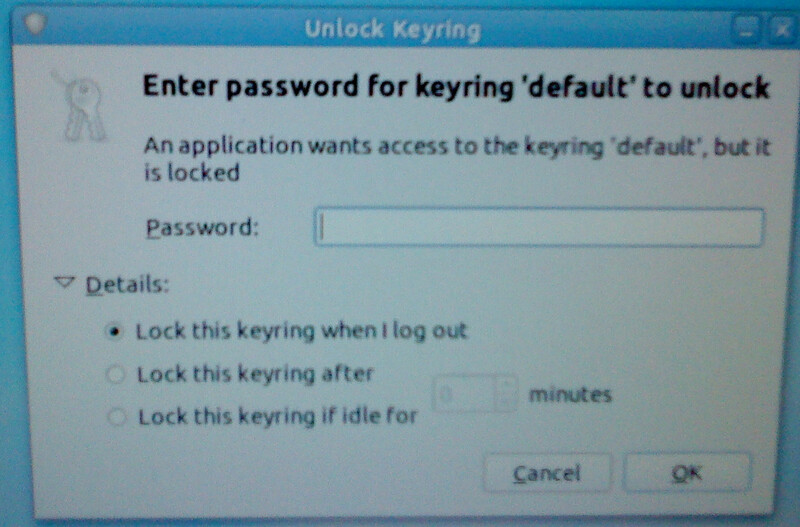 How can I find out which application is asking to unlock the keyring and fix it? and the "bugs" on bugzilla are probably being continually given priority of low because it's only for autologin users. it doesn't happen "out of the box" only due to customization. just trying to help you understand why it seems like the devs don't care. it's not a coding problem, it's...well...something else. and the reason it freezes the menu system is not because of gksudo, it's because it's an applet trying to start that grabs the tray and locks the menu-system. at least in my case you can still launch icons on the desktop. try putting a shortcut to a terminal there if you really must go mucking about with the prompt there. A similar question on unix.stackexchange.com. Several bug reports ( #575877, #246185) describing the same problem. None of them have a suitable answer, which leads me to believe there is no way to find out what application is asking you to unlock the keyring. Is it possible that you've changed your password recently? In order to see what passwords are stored in your keyring, go to "Passwords and Encryption Keys" in system -> preferences (I think - I always uninstall it as a security risk). In that application (called Seahorse by the way), click on the "Login" keychain and either change the password on that to match your current password, or remove the password from that keychain altogether by changing it to a blank password (you'll get a warning about using "unsafe storage"). Okay, Goto Your Home folder Places > Home Folder And Press CTRL-H to show hidden files then navigate to .gnome2/keyrings. Look at default.keyring. If it is there or there is some sort of file called 'default' then Look at it and that is the app causing you all this issue. Run System Monitor from System - Administration and check which application is throwing the prompt. Not the answer you're looking for? Browse other questions tagged seahorse or ask your own question. When I create an account without password, Ubuntu still asks for it! What could be the reason, that private keys are not unlocked?